Cast: Jack Nicholson, Morgan Freeman, Sean Hayes. Story: Two old geezers in adjacent hospital beds decide to enjoy their remaining time on Earth. I don't know why this wheezy Odd Couple movie wasn't bigger in the UK. It could've made a ton of money if it had been marketed right. 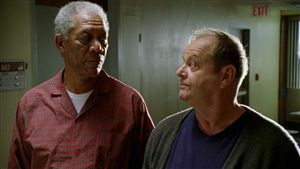 Handled differently, it could have been a dollop of sentimental claptrap - and it does recklessly walk that tightrope - but with Jack Nicholson and Morgan Freeman in Odd Couple sparring roles, it was always capable of drawing in the punters. Nicholson is a prickly multi-millionaire philanthropist, Freeman is a worldly wise grass roots mechanic (so no stereotyping there then); the pair share a hospital room after both being diagnosed with critical illnesses. The peculiar duo bond and decide to do all the things they want to do before they kick the bucket - hence the list. What follows is a largely predictable storyline, made golden by the infinitely watchable qualities of the two leads. Sole significant support falls to Sean Hayes, who is barely recognisable in manner from camper-than-a-Dormobile Jack in Will & Grace. Clearly he's trying to establish for himself a straight role - in both meanings of the word - but his mistake is toning things down a little too much, in the processing making himself instantly forgettable. The Bucket List barely avoids the honey-trap of sentimentality to create a touching movie that is entertaining, whilst being just soppy enough to give the subject matter respect, even if it takes plenty of liberties along the journey. At the end of the day, it's just a bit of silly fun, and we like that. To enjoy this film you should be: a little sentimental, but not too much. The Bucket List was released in the UK on 15th February 2008.